This beautiful state park is located in southern Virginia, along the Appalachian trail and not too far from my hometown. 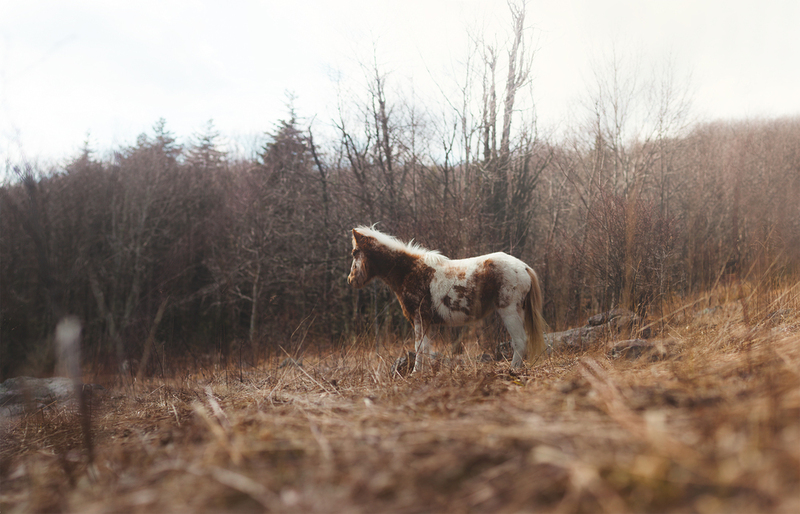 It's right near Mount Rogers and Whitetop Mountain, VA's two highest peaks at around 5000 ft. We took a family trip there when I was a kid and I always remembered the wild ponies that graze along the bald mountaintops. So Nick and I packed what we thought was everything we needed and headed up there last week despite the cold temperatures. Anddd then we realized we forgot the tent poles. So we strung up something kind of usable with string and a camera tripod and hoped for the best. I'm all about some camping... but it's so much more enjoyable when there's some running water, it's warm out, and the tent is in working condition! We hiked the Massie Gap trail, which leads to a portion of the AT and then back around through woods and rocky meadows. I thought the ponies might be hard to find and hard to get close to, but a few of them walked right up to us. It's a gorgeous place and definitely worth a visit if you get the chance. I'd recommend double checking your camping gear. Ya know, just in case.